The British Army WWI Service Records, the “Burnt Series” are in WO363. A little of the history behind this series was described in the last post. Here we will explain how to do a search at Ancestry.com and use a case study to show what the results might contain. 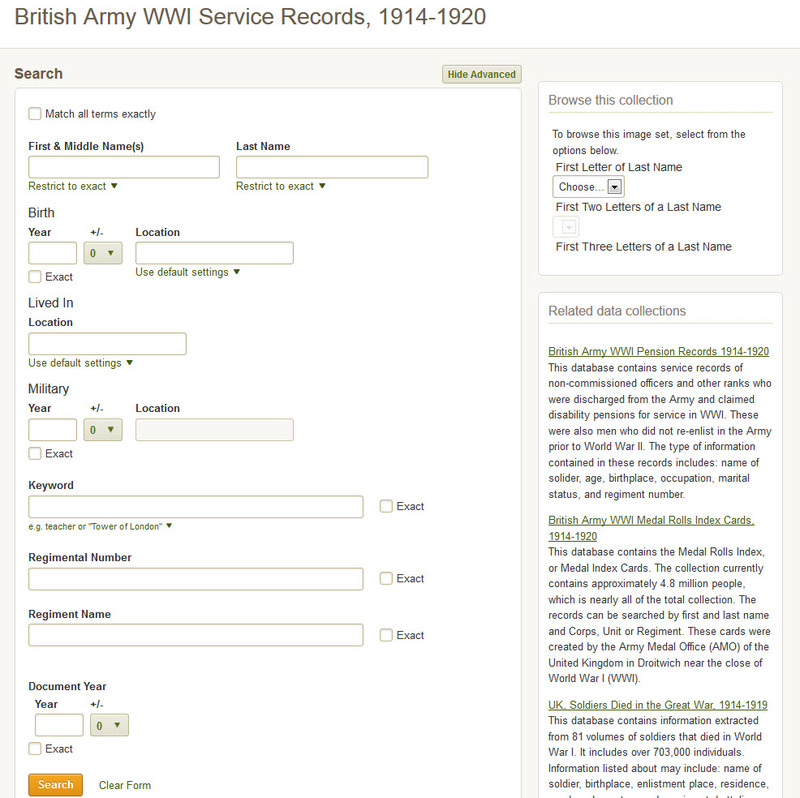 In searching I first select from the Search menu, specifically what I want – British Army WWI Service Records, 1914-1920. This allows me to search on a variety of fields, with the most frequent being last name and first name. But you also have the option of Keyword, Regimental number and Regimental name – the latter fields can be especially useful if you already know the number or regiment from other sources such as the Commonwealth War Graves Commission website (discussed in earlier blog posts), or from the medal rolls (to be discussed in a future blog post). For this case study we are going to search for Albert Milner. Nine results are provided. For some of the records the parish and county of birth are included in the index. The records themselves usually provide a parish of birth even if that information has not been included in the index. Helpfully for me the Albert Milner – full name Albert William Alfred Milner is identified, born about 1895 in Leeds in Kent. A total of 18 pages are included in the file. 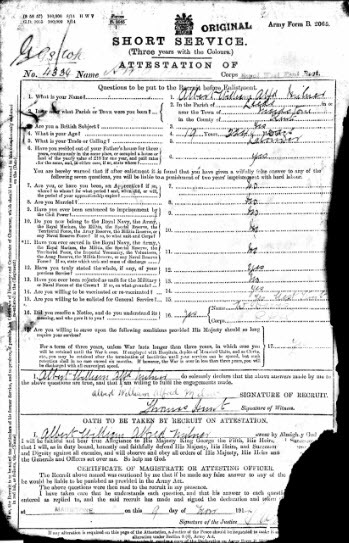 The number of forms that survive in any given soldiers file varies greatly, and just in the nine soldiers listed here they range from 4 to 56 pages, though it appears there are multiple index entries for the same soldier. One form that would have been in all soldiers files is his attestation form, created upon his enlistment. Ten different attestation forms are known depending upon the date of enlistment, period of service and terms of engagement. In our example for Albert Milner he attests using Army Form B.2065 for Short Service (Three years with the Colours), however the fine print under question 17 states “unless War lasts longer than three years, in which case you will be retained until the War is over.” Albert is attesting into the Royal West Kent Regiment, with a regimental number of 4334. This form shows his full name as Albert William Alfred Milner, born in the parish of Leeds, nears Maidstone in Kent. He is 19 years 224 days old and a labourer. This is all completed on 9 November 1914. Reading through the rest of the pages produces some valuable information about Albert William Alfred Milner. He attested at the depot on the 9 November 1914, he joined the regiment at Maidstone on the 10 November 1914 and was posted to the 8th Battalion of the Royal West Kent on the 11 November 1914. He is reported as wounded and missing on 20 September 1915. He is presumed dead on the 26 September 1915. This information is confirmed by searching the Commonwealth War Graves Commission website where we learn he is commemorated on the Loos Memorial but no additional information is provided to further identify who this soldier is. This is an example of how using multiple records can pull the pieces of a soldiers life together and positively identify him. Albert’s Medical History is recorded on Army Form B. 178. As on his attestation form we learn his age, place of birth and occupation. We now get a physical description – 5 feet 4 ½ inches, 119 lbs, a 37 inch chest with a 3 inch expansion. He is in good health, has no vaccinations marks, good vision, and needs some dental treatment. A later form in the file shows that in September 1914 he was inoculated twice. There is in the file a Casualty Form D.P. issued 6 December 1916 addressed to the officer in charge of infantry records at Hounslow that for official purposes Albert W. A. Milner is to be regarded for official purposes to have died on 26 September 1915 and that papers are to be created to notify the next of kin if they have not already been notified. This is potentially a long wait for the family to learn anything about their son, and also a long time for the death to be reported in the newspapers. 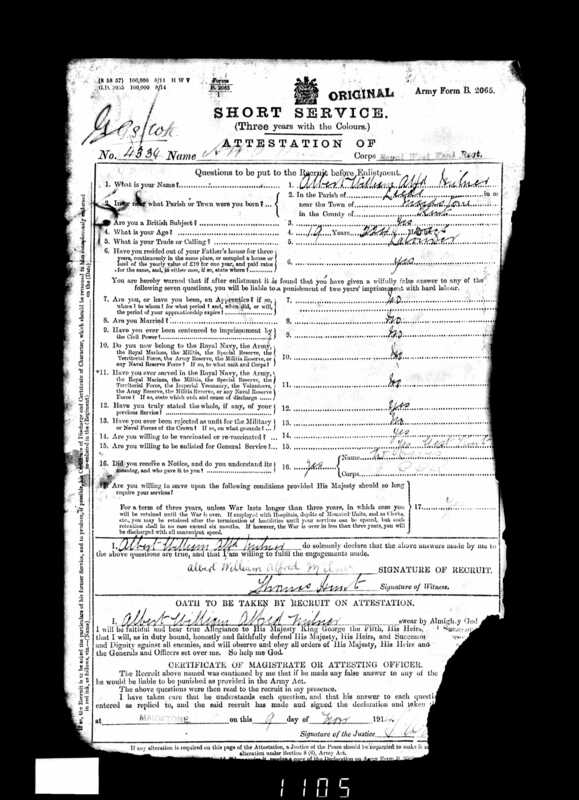 A subsequent Memorandum form – Effects Form 118A, on which the written date has faded, provides an address of next of kin as Mrs. N. Milner, Back Street, Leeds, Kent. An additional address on the side of the form shows Mrs. N. Milner at what appears to be 36 Fasthorpe Street, Putney. Another similar form dated 14 March 1917 shows the next of kin as Mrs Nellie Milner, Priory Cottage, 23 Knightrider St, Maidstone. An extract from the Ministry of Pensions Rolls shows the name and address of the widow as 36 Fasthorpe St, Putney, confirming the faint address written on the memorandum form. 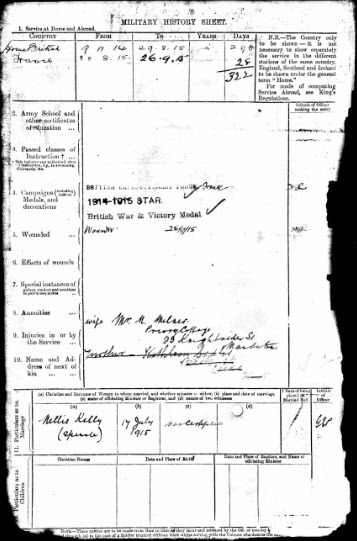 A F.3 – Form 50D, shows that on 29 June 1916, the widow of Alfred W.A. Milner, was awarded a pension of 10 shillings per week, effective from 10 July 1916 as Alfred had been reported missing. There is a receipt with the signature of Nellie Milner, dated 14 August 1921, acknowledging receipt of the A.W.A. Milner’s British War and Victory Medal and another receipt for the 1914-15 Star. One of the last pages in his file is the Military History Sheet. This identifies where he was serving, which in this case was primarily at home in England, that he went to France on 30 August 1915 and died 28 days later on the 26 September 1915. It shows the medals he was eligible for, that he was wounded, and that his wife was Mrs. N. Milner at Priory Cottage, 23 Knightrider St. Maidstone. He married Nellie Kelly, a spinster on 17 July 1915, and she was widowed just over 2 months later. The place of the marriage should have been provided but it was not. For the name of the officiating minister it says Mar. Certificate, possibly implying that they were married in a registry office. Prior to the marriage Alfred’s next of kin, crossed out, was his mother Kathleen Sadler [?] of Back Street, Leeds, Kent. To highlight the fact that the forms may not be in order, the last form in the file is the description form, completed upon his enlistment. We have his physical description as before on other paperwork but we also now learn that he has a fresh complexion, blue eyes, brown hair and is a member of the Church of England. This file certainly shows how jumbled up the individual pages can be but by reading and extracting each piece of information about the soldier his life can be reconstructed, including parents and next of kin, a physical appearance, and some of life in the military. The easiest way to access the records that have survived for WWI soldiers (not officers) is on Ancestry.com. There are two collections entitled – British Army WWI Service Records 1914-1920 and British Army WWI Pension Records 1914-1920. Let me explain what the difference is between the two collections before we get into examples in later posts. British Army WWI Service Records – “Burnt Series” – This collection is in WO363. The War Office records repository was on Arnside Street, Walworth and on 8 September 1940 there was a fire. The majority of the records in the repository were either totally destroyed or badly damaged by fire and water. What survived is approximately 25% of the original quantity and is now at The National Archives, in Kew. There are theories but it is not clear what records were at Arnside Street, or how they were arranged. The fire though was a major disaster for those researching WWI soldiers. Typically the files are for men killed in action, those who died of wounds or disease without being discharged from service, were executed, discharged without pension, or soldiers who were demobilized at the end of the war. The collection includes Regulars, Territorials, New Army volunteers and conscripts. The contents of the files vary greatly but may include attestation papers, discharge papers, medical records, disability statements completed on demobilization, casualty forms, and regimental conduct sheets. British Army WWI Pension Records – “Unburnt Series” – After the Second World War the War Office needed to find a way to supplement the records that had survived in what is now WO363. An appeal was made to other government departments that might hold records of service. The largest collection came from the Ministry of Pensions – thus this collection is commonly known at the British Army WWI Pension Records or the “Unburnt Records” – currently in WO364. It is important to understand that even though Ancestry.com calls these the Pension records they are not ‘pension records’ in the classic sense, just that the majority of the records came from the Ministry of Pensions. The records typically relate to regular soldiers serving in the army prior to the war who were discharged at the end of their service, those receiving a war pension who had since died or whose claims were refused, or men who later claimed a disability pension from either wounds or sickness. The collection does not include soldiers who signed up for the duration of the war unless they received a pension on medical grounds since such a soldier was entitled only to a gratuity upon demobilization. The original arrangement of the records when received from the Ministry of Pensions by the War Office is unknown, but the records have now all been alphabetized. The WO364 records contain some anomalies. The records include some soldiers who were discharged as early as 1875, long before WWI. There are files for British men serving in the South African Infantry of Australian Imperial forces who were discharged in Britain. These original records in these two groups occupy 44,000 boxes of material, much of which is too delicate to be handled. They have all been filmed producing 15,000 reels of microfilm. These films are available for use at The National Archives and at the Family History Library, but care is needed as all the names are not in alphabetical order, due to the number of cameras used in filming (WO363) or four different alphabetical sequences (WO364) . However, searching on Ancestry.com is so much easier, but again care is needed to ensure you have the correct soldier and all the records for that soldier. What is not included in either set of records is information for any other rank who saw service after 1920, or any officer after March 1922, or who left the army before these dates but were recalled or re-enlisted for service in the Second World War. Important Search Reminder – It is important to understand how these records have been put online. The pages of a file were first microfilmed in the order they existed within the file. They have then been digitized. An algorithm was then created to search for the attestation papers (joining) or discharge papers (leaving). Making a search then tells you how many pages are in a file, and when viewing an image will generally take you to the attestation or discharge page. This is the landing image and may or may not actually be the first image in the file. In examining the file you need to move back and forth reading earlier and later images in the supposed sequence to see if additional pages actually refer to your ancestors. 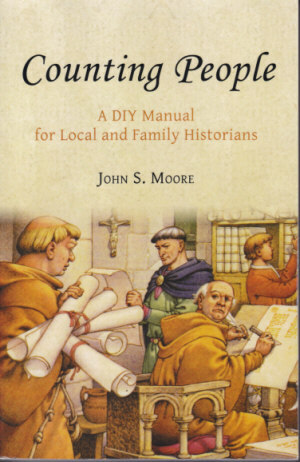 Counting People: A DIY Manual for Local and Family Historians. By John S. Moore. Published by Oxbow Books, Oxford, UK www.oxbowbooks.com. ₤17.95. US Distributor: Casemate Academic, 908 Darby Road, Havertown PA 19083. www.casemateacademic.com. $35. xii, 247 pp. Index. Softcover. The book’s introduction states that it is written for undergraduates and postgraduate students wishing to study local populations, and for those people interested in history who want to know more about the number of people in a particular area at some time in the past, how and why that number changed over time, what jobs these people had, the structure of their society, and its constituent households and families. As family historians this includes us and this book is certainly worth reading and using. The introduction suggests reading the last chapter first, which I did. This chapter on researching, writing and publishing gets the reader thinking about the research process, with good questions to be asked along the way to get organized and get results. It is also designed to get the reader thinking about what end result is desired – article, monograph or book, for that will help determine where to look, how and why. The questions raised here help the reader focus their reading in the other chapters to meet their specific needs. The book is targeting English demographers, those who want to work with population numbers, but that should not stop family historians using the same sources, though some will just contain just numerical data, still helpful, most are derived from and use personal or family data, and thus contain names. The first two chapters outline the problems and questions to be addressed in researching a specific geographic area (parish, village, town, or county) and the principal methods and sources to be used in addressing these questions. The remainder of the book is divided into three periods looking at the problems and sources to be used. The first period covers the Middle Ages from 1066 through to 1525. The second period is from 1538 to 1837 when parish registers are the main source for English population history. The final section covers 1801 through the present, when the census returns provide a reliable outline of demographic developments, obviously expanded from 1837 with reports from the Registrar General. Professor Moore assumes no expertise exists apart from a genuine interest in the subject. This means that the specifics are well explained. This might be how names or numbers are recorded in the records and how they need to be modified to get to population figures, appropriate for a demographer. For the family historian the author explains what it took to get on the list in the first place – specific age or income levels, land ownership, eligibility for military service, etc. The book provides a detailed description of what records were created, why and most importantly where to find the records and whether they may be in print or not. The latter is especially important as many of the original records will be in Latin, and on this side of the Atlantic it is easier to access print materials than to personally go look at the originals – though there are risks with that approach. Each chapter has extensive endnotes providing access to primary and secondary sources. Professor Moore practices what he describes with a case study for Frampton Cotterell in Gloucesterhire, providing estimated population figures from 1086 through 1801. This highlights the many sources that do exist for many communities within England. The section of book that I really appreciated was the extensive (57 pages) partially annotated bibliography. This in itself is divided into seven numbered sections: 1 – Introduction to local history; 2a – handwriting, 2b – language, 2c – dating, 2d – computing and history; 3 – Anglo-Saxon England; 4 – Domesday England; 5 – Medieval England, 1135-1525; 6 – Early Modern England 1525-1750; 7 – Modern England, 1750-2011. Each of period sections is subdivided into: sources; countryside; towns; population; economic and social developments. The bibliography does not claim to be a comprehensive listing of all printed sources or studies based on these sources, but some of the sections, e.g. local assizes, manorial records, feet of fines, lay subsidy rolls, are quite extensive. I have already been through this bibliography looking for sources I want to find and have ordered through inter-library loan. This book will expose the family historian to many resources, some of which will be familiar. I will guarantee though that you will find sources here that you have not heard of, or used. This will be especially true for those researchers who have traced back into the Colonial period and are now jumping the Atlantic and wanting to know what records are available to go back into the Early Modern or Medieval period in English research. This is certainly a book worth exploring.